Although we have at least two days in the next week that are guaranteed to creep us out in Champaign-Urbana and nationwide, let’s concentrate on the first one first and worry about the midterm elections when we get to them. (However, if the thought of braving the presumably testy crowds at the polls on Tuesday, November 6, makes your skin crawl, you can vote early between now and then at select locations.) Since today is Wednesday, October 31, we’re obviously late in providing you with a primer on the shape of screams to come, but that does not mean we’ve run out of time to haunt your souls with The Shape and other ghastly goodies! Embedded below are a handful of relevant videos to amuse you whether or not you hit the Twin Cities tonight for the big Halloween season finale. First is a modern trailer for the theatrical re-release of HALLOWEEN, which will play the Art Theater this evening at 10 p.m. and give fans a convenient point of comparison between John Carpenter’s slasher classic and what former Roger Ebert’s Film Festival guest David Gordon Green and his collaborators achieved with their “alternate timeline” sequel. Despite the recurring (if fictional) setting of Haddonfield, Illinois, we believe a Michael Myers rampage has yet to be filmed in the Land of Lincoln; location photography for the 1978 original took place in southern California. 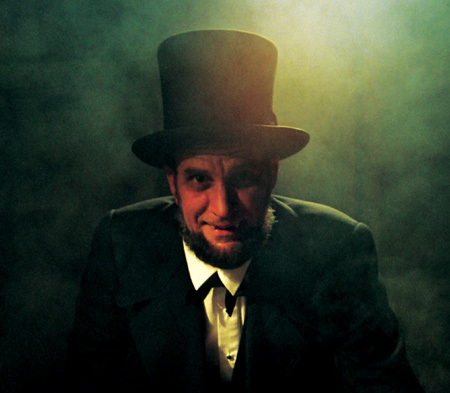 Speaking of our 16th president, the next teaser is for Chris and Anne Lukeman’s endearingly silly THE TRANSIENT, a locally-made horror/buddy movie that introduced the world to one Vampire Abraham Lincoln. Starring Dave Ruthenberg, Blake Stubbs, Michael Krebs, and Vanessa Prokuski, the convention circuit favorite began its undead life 10 years ago this past August when it premiered on the University of Illinois campus. Then, we have a vintage preview for an opus that supposedly takes place across the farm country that surrounds UIUC and the C-U despite its unmistakable Californian mountain ranges, BEGINNING OF THE END, in which Peter Graves and Peggie Castle join the United States Army in warding off a horde of locusts enlarged by radiated crops. (Yay to super-science and Midwest agriculture!) This sci-fi B-film from 1957 is surprisingly hard to find on home video or video-on-demand. Finally, we have the new short subject IRREPARABLE, directed by frequent partners Thomas Nicol and Andrew Gleason and featuring Cara Maurizi and Eric Beckley as parents grieving the loss of their infant child who inadvertently discover a way to reclaim fragments of their joy with unspeakable consequence. This C-U production has played several festivals and is eliciting a good amount of response from viewers about its gut-wrenching effectiveness. Happy Halloween! p.s. Fellow former “Ebertfest” guest John Sayles lends his thoughts on BEGINNING OF THE END to an episode of “Trailers from Hell,” a fan-favorite series co-founded by his New World Pictures cohort, Joe Dante. p.s.2 Ebertfest 21 passes go on sale tomorrow, Thursday, November 1, at the Virginia Theatre. This has been a public service announcement du C-U. Halloween from CineLife Video Showcase on Vimeo. Irreparable from Thomas Nicol on Vimeo. This entry was posted on Wednesday, October 31st, 2018 at 5:30 pm	and is filed under Area Festivals, Gone Hollywood, Student Film, The Old School, Videos du C-U. You can follow any responses to this entry through the RSS 2.0 feed. Both comments and pings are currently closed. 14 distant relations of Jan Tschichold dissected this page in 0.475 seconds while exacting sweet revenge in silence.